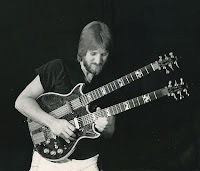 In 1979, West Coast jazz-fusion pioneer Don Mock commissioned luthier Lane Moller to build a one-of a kind double-neck guitar synthesizer. 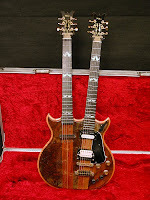 Mock designed the custom guitar to have a special upper neck/fingerboard using the electronics from Ampeg’s experimental Patch 2000 Guitar Synthesizer from 1977. The lower neck is a standard double-pickup electric guitar equipped with a Roland guitar-synth pickup system. Mock developed an amazing “left-hand” hammering technique for the electronically-wired fret/string upper neck. With his right hand, he manipulated the pitch-bend lever located near the lower cut-away. Because the strings just have to make contact with the frets to trigger the synth, this may be the fastest tracking guitar-synth ever built. The analog technology at the time, however, only allowed for single notes, restricting dynamics and chords from being played on the upper neck. The guitar weighs nearly 13 lbs and has a maple, mahogany and curly walnut body with mahogany necks with maple accents. It has intricate inlay on the headstocks and the ebony fingerboards. The Grover tuning gears, bridge and fine-tuning tailpiece are gold plated. A three-way switch, volume and tones and a master stealth volume dial under the pickguard control the two DiMarzio pickups on the lower neck. Both necks have 1 3/4” wide nuts and measure 2 1/16” at the 12th fret. The scale length on the lower neck is 24 3/4”. The upper neck does not use a standard scale length. 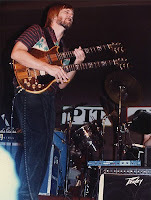 Mock designed a special fingerboard/fret spacing that best accommodated his ‘hammering technique.” Since the strings and frets are electrically wired, string gauge, tuning and fret spacing are irrelevant. The frets are spaced a bit closer together near the nut but are slightly farther apart in the upper range then standard spacing. The strings are brought up to a tension that feels and responds best for the playing technique. In fact, the strings are deadened with strips of felt at the nut and bridge for quicker and cleaner tracking. Mock’s complex synth system includes a control panel case which houses the “Patch 2000” petal electronics and two Oberheim Expander Modules. 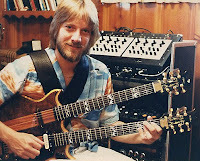 The Sho-Bud petal controls the “resonance” of the right side module which gives Mock his “Jan Hammer” like phase/sweep tone he uses a lot of the time. To handle the weight of the guitar Mock uses a special “both shoulder” custom made leather strap. The control panel box houses the controls from the Patch 2000 and Oberheim modules. These include a 5th interval switch, a glide control, VCO, Gate, Trigger and S. Trigger 1/4” jacks. Each module has a mini-plug line-out for some great stereo combinations.